The gods have summoned you from the mortal realms to the world of the celestial islands. You're there to compete against other mortals, with the winner becoming a new demigod. 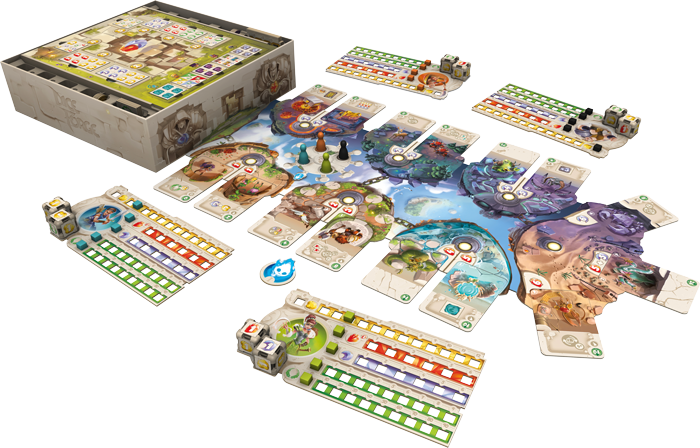 Dice Forge is a new board game coming from Asmodee and Libellud. The game uses a unique dice-altering system where it's like a deck builder, but you're actually changing the faces of the dice you have, upgrading them from the basic faces they come with to much more powerful abilities. Greetings, mortal! Stories of your heroic feats have traveled throughout the world and into the divine realms, and now, you find yourself transported to the celestial islands, where your mighty deeds will honor and entertain the gods themselves. Many will compete, but only one can craft a new destiny in Dice Forge, a new board game for two to four players from Libellud! To claim victory in a game of Dice Forge, you will need more glory than any other player—which you can achieve by performing heroic feats among the celestial islands of the divine realm. Your dice are the key to obtaining gold, gathering shards, and achieving these legendary deeds, but their initial form won’t carry you to victory. You’ll need to reforge your dice and make your own luck over the course of the game if you’re going to become the newest demigod of the divine realm. With a mix of innovative mechanics, resource management, and a stunning presence at the table, Dice Forge deserves a place in every gamer’s collection. You can expect Dice Forge to hit store shelves sometime in the 2nd quarter of this year.